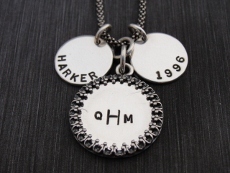 A framed 5/8" sterling silver disc can be stamped with your monogram initials, name, or favorite word. The other two discs can be stamped with names, dates, or any affirmation. The discs are hung from a sterling silver thai bead chain in 16", 18" or 20"